Captured most visibly by Nagy’s attempt to withdraw Hungary from the Warsaw Pact and Czechoslovakia’s Prague Spring of 1968, members of the Warsaw Pact frequently sought to loosen the reins of Moscow. When taken too far, from the Soviet perspective, the effects could be devastating. Soviet tanks became a universal symbol of Soviet determination to hold on to Eastern Europe, through undisguised oppression if necessary. In the Early War and Mid War, this is generally at worst an empty Action Round and nothing more. If under Red Purge, then it’s slightly worse than an empty Action Round, but the only two countries that really matter to you in Eastern Europe should be East Germany and Poland. Much as the threat of a Socialist Governments headline forces the US to slightly overprotect its Western European battlegrounds, so too does East European Unrest force the USSR to overprotect its battlegrounds, as otherwise an EEU headline would be quite awkward for the USSR. And if you’ve overprotected the two battlegrounds enough (or Comecon / Warsaw Pact did it for you), then this isn’t even an empty Action Round, and you can freely spend the Ops elsewhere. Think of it as transferring 3 Ops from Eastern Europe to somewhere else. In the Late War, this card is absolutely miserable. Losing 4 Influence from East Germany / Poland simultaneously, right as you’re being hit with Chernobyl / Tear Down This Wall / Solidarity, can be brutal. It’s not quite as bad as the others, but it’s a good candidate for the Space Race. Be glad you drew it and not the US. In the Early War and Mid War, you usually have something better to do than remove from 3 Influence from overprotected or irrelevant countries. It can be a decent headline (threatening Europe Scoring on AR1) or AR7 play, but usually the USSR has overprotected East Germany and Poland enough that there’s not much point to it. In the Late War, this card is an absolute monster. 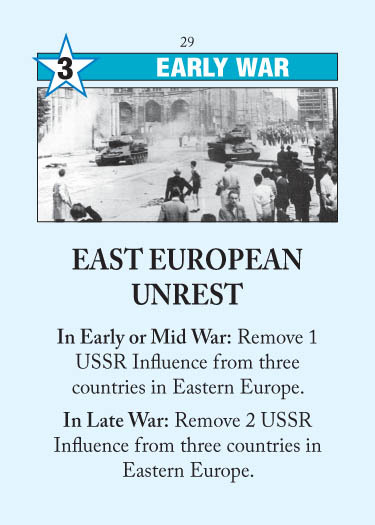 Combined with all the other pro-US Europe cards, being able to delete two influence from East Germany and Poland simultaneously is huge. It’s more than just a 4Ops equivalent: its real use is to break USSR control of the two countries, allowing you to pour in influence without paying the 2-for-1 penalty. Coupled with Chernobyl, it opens the floodgates to the Late War American takeover of Europe. If you draw it on Turn 7, do everything in your power to hold it until next turn. This entry was posted in Early War, US Events and tagged east european unrest. Bookmark the permalink. I agree that the US often have better things to do than getting IP out of overprotected countries. On the other hand, it depends on how much the Russians have put in Poland and East Germany, and your plans for the Late War. The Americans can increase the power of the card in the Late War by decreasing the amount of IP in these two countries before (even when they are both overprotected). As USSR I typically setup 4 Pol 1 EGer and 1 Yug to give me access to Greece and Italy. Removing the one influence from Yugoslavia means losing access and means that I can’t “neutralize” Marshall my taking control of both Greece and and Turkey with its 4 ops before triggering the event. Still, US in the Early war has typically many more uses for 3 ops than removing access that is quite easy to re-establish with Comecon or Warsaw pact, for example. If US draws East European Unrest and Truman Doctrine in their first hand, what do people think about headlining East European Unrest to remove 2 from East Germany and 1 from Yugoslavia? USSR coups Iran on AR1, you put 3 (or 4 to guarantee) in East Germany and then you can just take it at your leisure, playing Truman when you have time or when USSR drops more influence there. You net East Germany, eliminate their access to Greece, and, if they fell for your Truman trap (although a good USSR player shouldn’t), you eliminate a lot of their ops in East Germany at the cost of a headlined East European Unrest (3 ops) plus a 4 ops card on AR1 plus Truman Doctrine sometime after that. The added bonus of playing Truman Doctrine to eliminate the USSR influence is that even if you draw Warsaw Pact Formed later, you can just play it, activate the event to remove your influence in East Germany (if USSR so chooses) and then replace it with the 3 ops. The main disadvantages that I can see of this play is that the 7 ops total from East European Unrest and the 4 ops card is a lot early on, but if you don’t have any other decent headlines might it be worth it? What are people’s thoughts on this play? It is not possible as you are only allowed to remove one influence per country in Early war. If the USSR starts with 4 influence in E. Ger, the whole thing is useless. Of course if you take it down to 3 and the Soviets don’t fix it, you can take it up to 3/3 with a 4 ops card with your last AR play and eliminate the 3 USSR influence with Truman. Which is not necessarily a bad move but quite a lot of ops spent there. In the Late War, could you remove only 1 point if there is no other choice?